We’re probably going to get the first trailer for director James Wan’s Aquaman movie later this week during Comic-Con, so to try and go fishing for a little bit of hype, Wan has shared the first teaser poster for the film on social media. It’s a pretty standard one-sheet, with Jason Momoa’s eponymous man wearing leather pants and doing a hero pose with his trident (pentadent? ), but something about it seems a little weird to us. This is slightly reminiscent of the tragic Photoshop accident that gave Alicia Vikander a bizarrely long neck on a poster for her Tomb Raider reboot last year, and while it’s not as freaky as that was, we’re still wondering just how big Aquaman is supposed to be. The poster shows him leading an army of sea life, consisting of mostly sharks, turtles, and orcas, but a lot of them seem smaller than they should be. We all saw Blackfish, and the orcas in that were definitely bigger than turtles. There are also some orcas on the bottom left that seem to be smaller than a ray, which throws the whole scale in disarray. Is Jason Momoa really a giant? Google says he’s no taller than Ben Affleck, but maybe that’s using land-based measurements that don’t really capture the true height of an Atlantean. 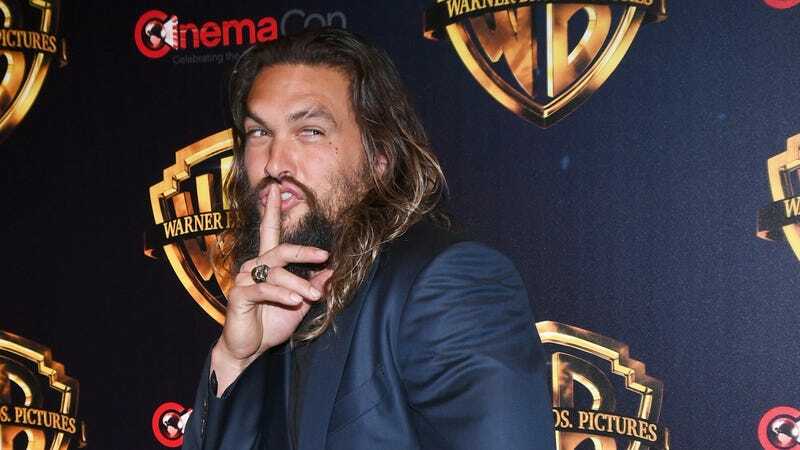 Luckily, we’ll have plenty of time during Aquaman to solve this mystery, because JoBlo has a massive scoop on a previously unknown detail about Wan’s film: Apparently, more than half of the movie will take place underwater. That’s right, the guy named Aquaman who lives in an undersea kingdom and has some superpowers related to water and water-based creatures, will spend most of his solo movie splish-splashing underwater. Seriously, how big is an orca?